Rainer Wachtstetter represents the fourth generation at the estate. It all started in 1890 when Karl Combé, a descendant of a Waldenser family, fled prosecution in Southern France and settled in the Zabergäu area of Germany. He married in to the Veicht family, owners at the Gasthof Adler in Pfaffenhofen. Unfortunately, his wife died while birthing their first child. His father-in-law urged him to remarry and with his second wife had six children. The most enterprising of which was Ernest Combé born in 1900. As a young man he not only expanded agriculture and livestock farming but also had an interest in wine beyond the needs of the restaurant. He completed apprenticeships at the prestigious estate of Graf Adelmann and at the Markgraf von Baden/Schloss Salem. In 1956 he completely rebuilt the Gasthof Adler. During this time he built a viable business for the family. In later years he became a big influence on his grandson Rainer until he passed at age 95 in 1995. Rainer has since dedicated a top quality series of red barrique wines in memory of his grandfather. In 1962 Ernst Combé's future son-in-law, Roland Wachtstetter married his daughter Anni, changing the estate's name to Wachtstetter; Rainer was born in 1968. His father Roland had taken charge of the estate in 1967 and continued to build and grow the family business. Even when very young, his son Rainer took great interest and a liking to wine. In 1985 at the age of 17 he entered an apprenticeship at the G.A Heinrich estate in Heilbronn. During his work at Heinrich at age 18, he did a cost analysis of the family business, assessing profitability of agriculture versus wine. Wine was the hands down winner. On a weekend home he presented the study to his family. After three weeks of sleepless nights his father agreed. When Rainer returned home two weeks later he noticed that anything to do with agriculture was restored, repaired, repainted and ready for sale which his father told him he planned to do in the coming months. However, Rainer wanted his father and mother to continue to manage the restaurant and butcher shop both of which were profitable and something they both enjoyed doing. Rainer is forever indebted to his father for his continued support in all matters of wine. In 1987, Rainer's first vintage, he began his studies at the wine school in Weinsberg. In 2003 Rainer took charge of the estate. In 2002 he became a founding member of the group "Junges Schwaben". They meet regularly as a group to discuss work in the cellar and the vineyards and how to improve the quality of their wines and in fact all matters of wine. With this information exchange there has been continued progress and improvement in the quality of their wines. They participate in trade fairs together and jointly promote their wines. In 2010 the group garnered the Art Vinum price as the most successful young vintners in Europe. In 2009 the Wachstetter Estate was invited to become a member of the prestigious VDP organization. In 2015 the Eichelmann Guide selected Wachstetter for the red wine collection of the year in Germany. We feel privileged to represent this great producer. Rainer Winemaking Philosophy: "My Goal is to produce wines that are strongly expressive, that impact the palate along with complex, intense aroma profiles and inherent power and minerality. I want to achieve the potential of our vineyards that are up to 60% steep through sustainable care, to preserve the health and preservation of our soil using only organic fertilizer along with targeted efforts to achieve green areas while working as close to nature as possible. To work with low yields with efforts to create the appropriate leaf surface in the plants always searching for an ideal harvest date while selecting fruit as perfect as possible with two to three passes through the vineyards. It is basic to produce wines with character. In the cellar we use the gravity principle to treat grapes, must and wine. We work as gentle as possible. No pumping! Our red wines go through classic maceration and are predominantly matured in wood. Top quality reds spend 12-24 months in barrique. The very best wines are bottled without fining and filtration. Our white wines are also treated with great care. We use gentle whole cluster pressing, maceration and fermentation that more and more involve indigenous yeast followed by very long contact on the fine lees." Terroir/Soil: All the Wachtstetter Pfaffenhofer sites are part of the Hohenberg vineyard. 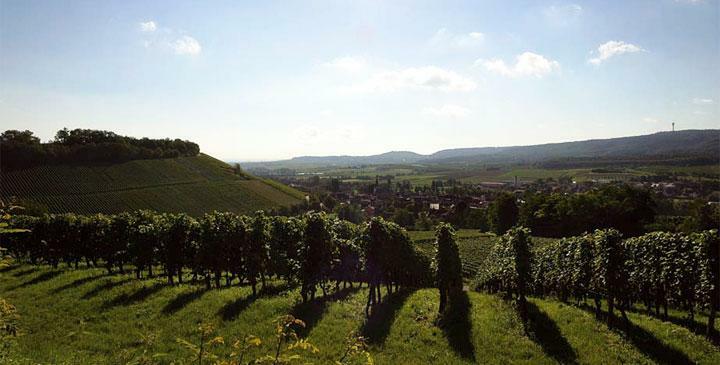 The warm south facing sloped Henchelberg with 65% inclination is in the lower portion consists of the vineyard and of Gips Keuper whilst the upper third portion of the vineyard is mostly sedimented reed sandstone. It reaches up to 300m at the peak. The very best qualities are usually sourced from the upper portion of the vineyard, where the soil is almost barren, but where the vines are also able to push their roots deep into the sandstone to access the necessary nutrients. At the lower elevations, the Zaber, a tributary to the Neckar River, over millions of years, has added to the Gips Keuper yet at 80m of elevation where the reed sandstone is located was never reached or softened. This formed a plateau atop of Pfaffenhofer that prevents the edge of the slope to recede. Fragments, especially the weathered sand portions of the rocks in the vineyard, are laced with gray-violet marl and Gips Keuper. This mineral rich, not too heavy soil, is easily reached and penetrated by the roots which provide ideal conditions for vigorous growth of the vines. Internal Classification: A top estate has to show quality even in the basic wines. Even the liter bottling of Riesling, Trollinger and Lemberger must offer quality wines. These wines never carry a vineyard designation. For his three children, Rainer has dedicated a category of wines from Riesling, Pinot Noir and Lemberger in the middle segment. A premium segment is dedicated to this grandfather Ernst Combé which are exclusively red barrique wines. In the best years Rainer produces the great Lemberger "Junges Schwaben" and the Grosses Gewächs wines from Hohenberg, from both Lemberger and Riesling. Both of these wines carry the additional word "Glaukos". These wines are selected from the filet piece of the Hohenberg that has a significant content of the mineral Glaukonite. This separates the Grosses Gewächs wines from other Hohenberg wines. Wachtstetter is a member of the VDP.